I've heard of the FATE system itself before, but have never actually tried playing it. This still sounds like a good deal, though. RPG book collections can get pricy and costly on shelf space. 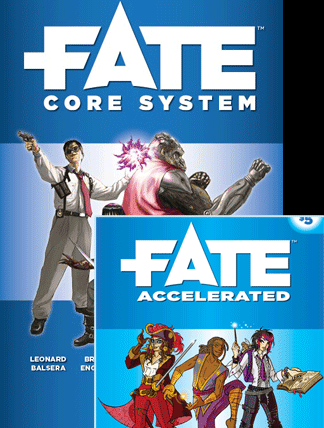 I have the FATE core rulebook and read it through, but haven't gotten the time to play it. Do you want a RPG system that has a strong focus on story and narattive and can be used for literally any setting (even ones you dream up yourself)? GET THIS! I can't wait to get some people together and run this, because the rules seem so simple, yet have a nice bit of nuance to them. Definitely sounds like a great deal. IMHO Fate is a great system with the right group of people, willing to bounce ideas off of each other and tell a story together. If you're group has a player or two that needs structure or specificity in rules (A more D&D style mini's and tactics RPG) then they will struggle with this game big time. I played a game of this with a group at a nearby comic shop and getting some of the guys to put down their dice and actully talk and contribute was like pulling teeth. I'm still getting the bundle though because when Fate works, it's awesome! I've been playing the same DFRPG game twice weekly for 4 years now (fate system). I love the fate system, it lends itself so much more to role play than D&D. Not that D&D is bad but in Fate the characters and the story are the star and the combat accommodates them rather than the story and the characters accommodating the combat.